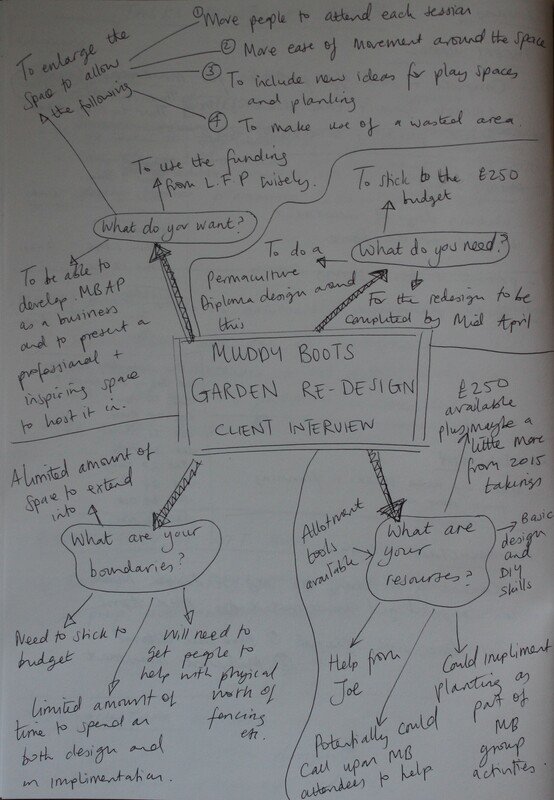 Muddy Boots garden re-design. CEAP. Collect site information. 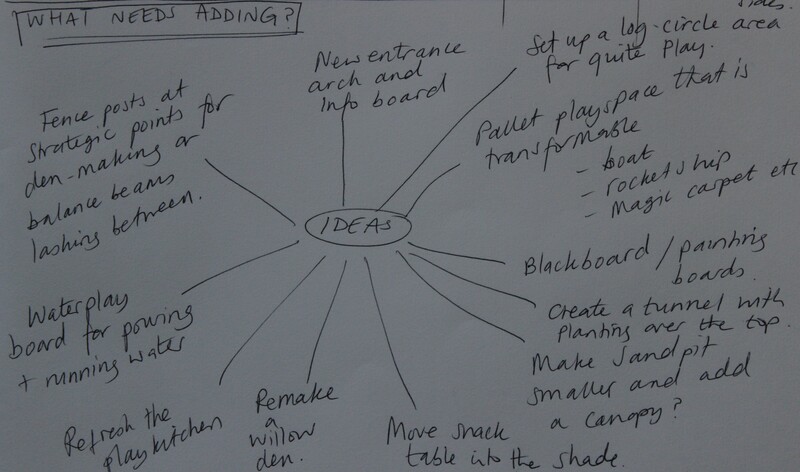 At the moment I am re-designing the area of the community allotment where I run Muddy Boots Allotment Playgroup. We were lucky enough to be awarded £250 from a local funding body at the end of last year. I have managed to squirrel away most of this money and plan on putting it towards physical improvements and enlargements to the space. My Muddy Boots group is entering its 5th year now, but its only really the 2nd year that I have ran it as a businness with the aim to make money and for it to be my career rather than a hobby. So this year I hope to enlarge the space to be able to fit in more people and to run twice the amount of sessions. The aim of this Permaculture Diploma design is to enlarge the fenced-in area and re-design the space where the group meets. I initally designed the space as the project I undertook as part of my PDC back in 2012. You can view the original design and process here. My PDC design. I have decided to use the process C.E.A.P to structure my design. This design process has been chosen for two reasons, firstly because I’ve not used it before and secondly because it seems quite quick and easy compared to other design processes. I need this design process to happen quickly due to a deadline of mid April for the changes to be implimented by when the group begins meeting for our Spring season. To collect site information I used the following Permaculture tools; meeting with relevant people, observed and measured the space, drew a base map, did a client interview, thought about boundaries and resources, did some wild designing, thought about functions and elements, looked at zones and sectors and took observational photographs. 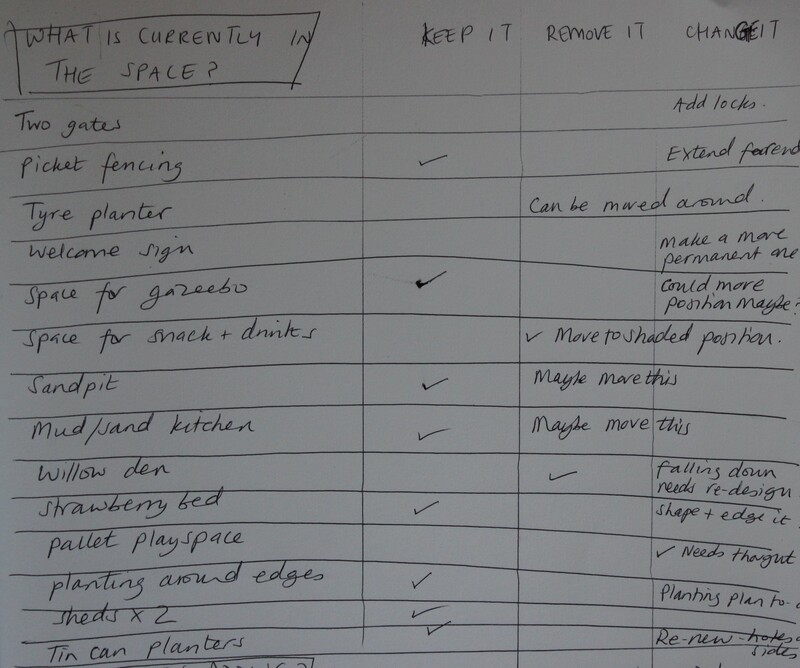 In October 2015 I had a meeting with Sue, the lead volunteer gardener for the community allotment and we discussed my plans for extention and redesign. She gave me the go-ahead to proceed with the proviso that I do all the implementation and general maintainance myself or with members of my group. I am lucky that Sue is also involved in Permaculture and is very supportive, even if some of the other allotment gardeners have not always been so happy to have a large group of toddlers and children rampaging around their patch! I measured up the space and drew a rough map showing sizes. I considered how much additional space I would need and where this could be located on adjoining land to make the best use of the plot. This showed me how much additional fencing I would need to purchase. I measured up the existing fencing to try to match fencing for the new area. I did a client interview with myself as client to really focus in on why I wanted to do this redesign and what I wanted the outcomes to be. I thought about functions of the space, what my boundaries and resources were. Boundaries. The main boundaries are time, money, energy and skills. Time I have about 10 weeks currently till the site needs to be ready (early feb – mid april) I can devote a few weekends and a few thursdays to implementing the design. Money I have £250 funding plus £50 saved from last years takings, so a total of £300 available to cover all expenses. This must include plants, seeds, compost and this years resources I need to buy in advance. Energy I have some time put aside to devote to the design and implementation. I will have some help from my husband and can maybe suggest to the group that they can help too if they’d like to. Maybe the community allotment volunteers could do some jobs on tuesday mornings? I need to talk to Sue about this. Skills I have very basic skills in woodworking. I am good at gardening, creative jobs and garden design. I need help with the heavy lifting and technical stuff. Lots of the jobs will require two or more people. Resources on site that I can use in my redesign. To stop myself getting too bogged down in the detail and to see the bigger picture again, I did some wild design thinking and came up with some outlandish ideas just for fun. I have had some time, space, money, help, ownership of the land then I’d love to do some or all of these crazy ideas! Then I brought myself back to reality and I thought about what elements were already in the space and what I wanted to keep, remove, change and add. Next I looked back at my original basemap drawn for the site in 2012 where I had added notes about the zones and sectors of the site. These initial observations were pretty accurate, so I used this to do an updated base map showing the increased plot size and what was currently on site. The portion of the space to the left hand side of the dotted line is the new area that we will be expanding into. I took some more photos of the site as it is now, 3rd feb 2016 for reference and to help me with my designing. The new boundary will follow the existing fenceline out to almost the end of the dug bed in the middle of the picture then turn 90 degrees and meet the fence. This will enlarge the space available to me by approximately a third. Looking over the existing fenceline to the area that will now be included. The area currently includes a raised bed, two barrel planters, a small cherry tree, a wire and wood fence and material storage. The fencing can be reused. I will take down the fence at the east end of the plot and reuse this elsewhere. There are two sections of picket fence here 1 is 10.5 ft long and the other is 12 ft long. The fences look like they have been purchased as individual elements and constructed to fit the site. It should be possible to take them down as two pieces and then remove the fence posts or use them within my design. 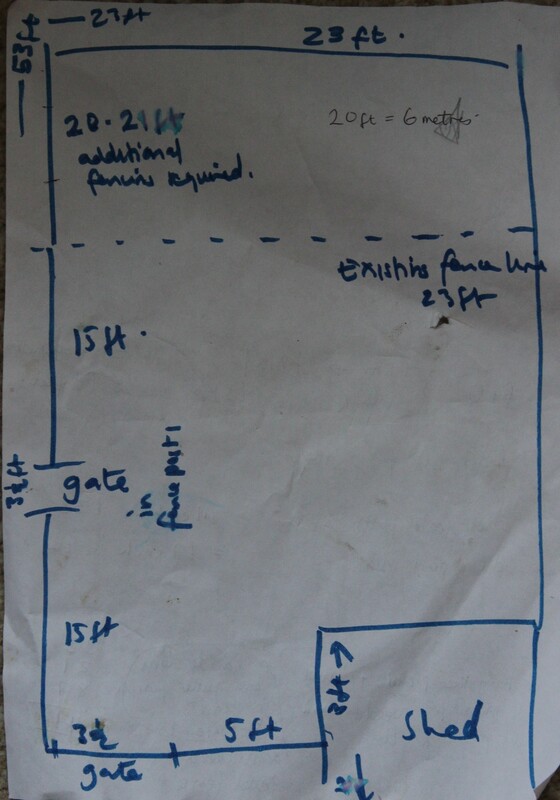 This entry was posted in Uncategorized and tagged Base map, boundaries, CEAP, Client interview, diploma design, elements, functions, Muddy Boots garden re-design, observations, Permaculture, Permaculture Diploma, Photography, resourses, wild design, zones and sectors by emilycrofton. Bookmark the permalink.